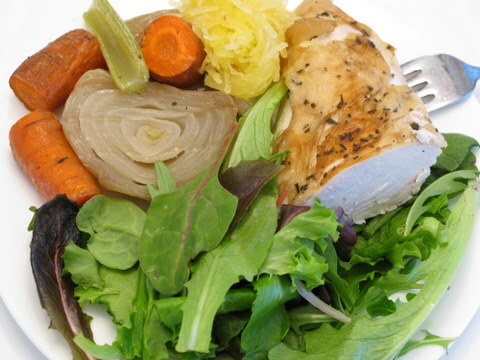 This article is part of a delicious frugality series called How to stretch a whole chicken into many healthy meals. To start this plucky series from the beginning, read the introduction. 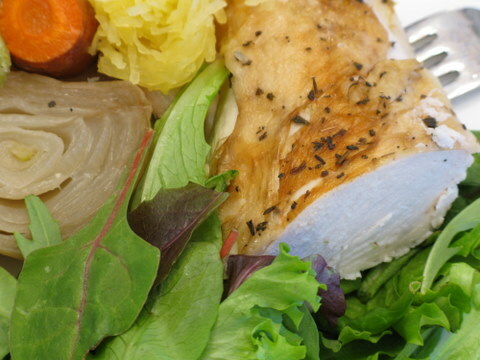 Stretching a whole organic chicken into 22 healthy servings for $49 bucks is easy. It’s the meat measuring, food photographing, blog writing, and penny counting that nearly killed me. Unless you scrapbook every morsel of food you eat, stretching a chicken shouldn’t be this onerous for you. Promise. Anycrazyblogger, so why did I attempt such an arduous frugal food experiment? Easy. I wanted to prove that eating healthy, organic food on a budget is possible when you take the time, put in the effort, and have a plan. Yes, I am certain you can make these healthy meals cheaper by using a non-organic chicken. So if an organic chicken is not in your budget, that’s OK. 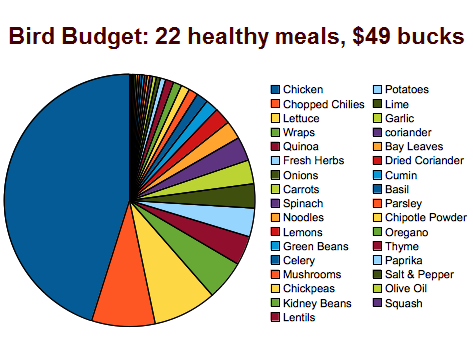 The point is that eating healthy food is not as expensive as so many people often whine about. Buying packaged products and eating out is what kills the family budget, not healthy meals made at home from scratch. 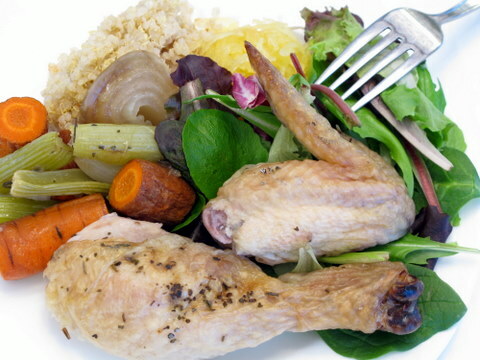 Rule One: Must use a whole organic chicken (read why). Rule Two: Meals must be healthy and frugalicious. No deep fried battered chickens on a stick. Rule Three: Most food must be from fridge or pantry. No big shopping trips! Rule Four: Each meal must feed at least two people, leftovers are encouraged. Rule Five: Meals must have some variety. Rule Six: Meals must all be made in my slow cooker. I’m lazy, busy, and I love coming home to a hot meal. Rule Seven: The cost must be reasonable — I’m not trying to out cheap the internets, but rather have an honest go at making healthy meals with the food in my house while using mostly organic ingredients. Cheapest isn’t always bestest, anyways. I’ll stop flapping around now. Here’s how I stretched a single organic chicken into 22 healthy meals for $49 bucks — this includes side dishes too people! 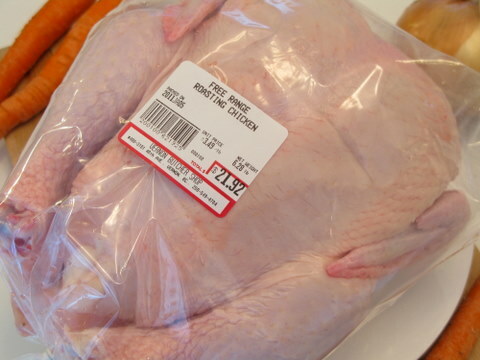 I started this frugal adventure with a single 6.28lb organic chicken for $21.92. Not so frugal you say? Admittedly, this chicken was by far my biggest expense. I used to be scared of baking a whole chicken. Not anymore. Follow my instructions and you’ll be fine. Sides: spaghetti squash, salad, roasted vegetables, quinoa. I prefer light meat while Carl enjoys dark. And yes, Carl got a little annoyed (and hungry) while I photographed his meal. Being married to a blogger can be brutal. Why only 1/2 breast and a few chicken pieces? Well, the amount of meat on this organic chicken was mind boggling. I took the time to measure just for fun. 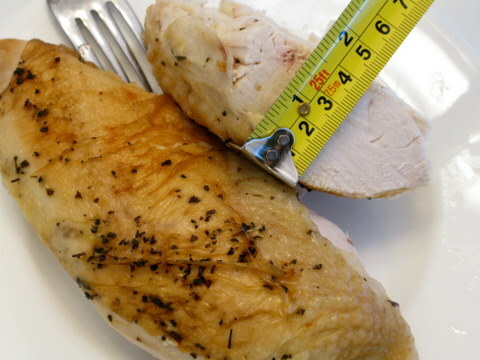 Each chicken breast measured about 8 inches long, 3 inches wide, and 1.5 inches thick. That’s bigger than any boneless non-organic chicken breast I’ve bought from the grocery store. Plus, the amount of meat from the carcass, legs, thighs, and wings was astounding. It sounds funny, but I think our organic chicken yielded far more meat than the non-organic birds I’ve bought in the past. So I deem this pricey poultry a winner! After our baked chicken dinner, I removed most of the meat from the leftover chicken carcass and made homemade chicken stock in my slow cooker. 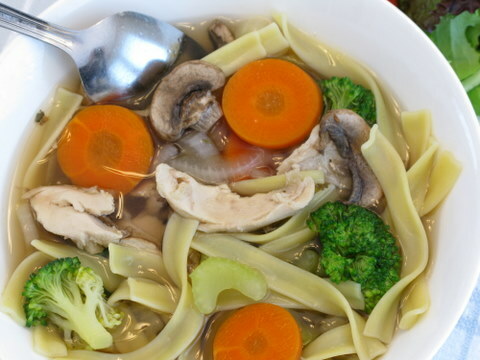 The idea was to further stretch this chicken by making healthy soups and stews with homemade chicken broth. 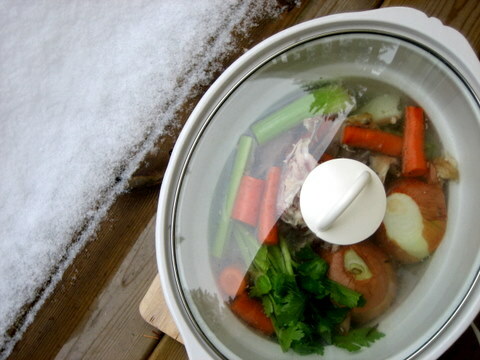 Making chicken stock is very frugal and super simple. I basically used ingredients I might have otherwise discarded, such as: the chicken carcass, past prime carrots, celery, and onions. If you’re new to slow cookers or crock pots, check out 6 Reasons to use a Slow Cooker and then see How to Buy a Slow Cooker for a few frugal buying tips. The White Chicken Chili feast was easily my favorite meal of the slow cooked bunch. Perhaps I was in the mood for something spicy, or I just love beans — either way this one was a winner. I had to invent my own version since most chicken chili recipes call for raw chicken. I also wanted to make do with the ingredients I had on hand. The most expensive part of this recipe were the two cans of chopped green chilies totalling $3.98. I couldn’t find a fresh alternative where I live, hopefully you can (and skip the cans). 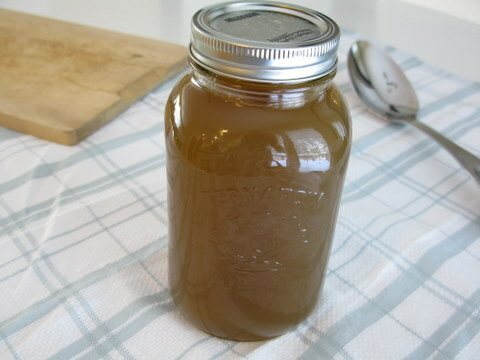 By day three of this frugal food experiment my gorgeous homemade chicken stock was ready. On this day we also experienced a cold snap and Carl got a case of ‘the sicks’. A sick man stuck inside a cold house is a grumpy (and sad) scenario, so I fired up my slow cooker and made a whole lot of chicken noodle soup. I enjoyed this recipe. But since I cannot eat gluten, I made my own helping with quinoa — a tasty gluten-free alternative. Learn how to cook quinoa for the details. 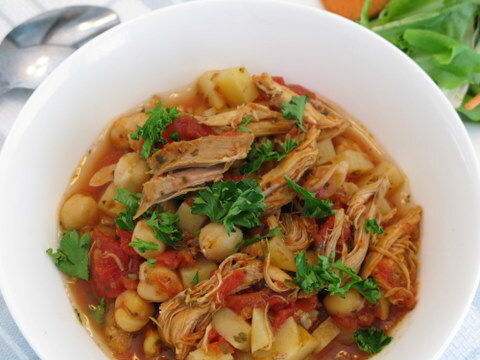 For this frugal chicken-stretching recipe all you need is a little leftover cooked chicken, a slow cooker, and some chickpeas. Easy, tasty, frugal, and good. 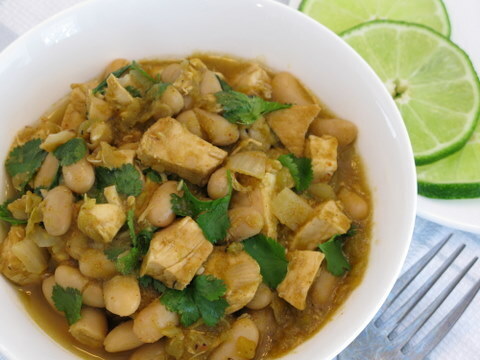 This recipe really stretches leftover chicken since it contains chickpeas and potatoes. We dined on this stew for two lunches and one dinner. I was thrilled to cut costs further by using tomatoes frozen from my summer garden. On my final chicken-stretching day I really didn’t feel like eating chicken. 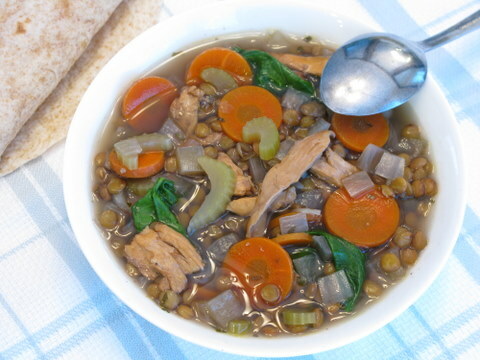 Carl still had a bad head cold so I made chicken soup for him, and added lentils for me. There you have it — 1 snarky blogger, 1 sick husband, 1 organic chicken, 22 healthy meals, all for $49 bucks. Yes, you might dine on fewer meals if you’re a construction worker. And perhaps you could stretch this cluck even further if you eat like a little person. Regardless of your caloric needs and consumption, I deem this frugal chicken-stretching experiment a success! That is just awesome … My favorite staple has just been given new life. Thanks. Im with you. It is smart to cook at home. This is a great concept because it isolates one main protein and follows it to its end when all of its nutrients have been consumed efficiently. That is how you manage a pantry. Managing a kitchen is comprehensive and takes a lot of practice. Here is a question that im pretty sure you have the answer to. How much perishable food is left at the end of a chicken and for how long could you stretch this master grocery list. Would you be eating chicken five days in a row? Maybe there could be a master pantry list that is just the same size except it includes two proteins or even three. thanks! Love these recipe ideas 🙂 The lentil soup looks fabulous! When I make soup, I often boil the chicken up in the stock. I usually end up with 10+ servings of soup (I make a big pot and freeze most of it) and the left over meat usually does me for 4-5 meals. I throw it in stir fry, make sandwiches, wraps, salads, etc. I’ve never tried organic chicken, but I think you have me convinced. Thanks for doing this series! This is amazing! And thanks for the Master Shopping List. That was the one part I was dreading and then I got to the end and there it was!!! We already make our own stock and really stretch a chicken, but I always enjoy getting re-inspired with new ideas for additional meals. Thanks for those. Our family favourites with leftover chicken are quesadillas (and my partner has begun making corn tortillas instead of buying packaged stuff – much cheaper and tastier! ), burritos, pizzas, omelettes and stir fries. This is great! We buy in bulk and I’ll spend a week-end day cooking, tupper waring and freezing. This is great to simply pull out of the freezer for those hectic/lazy days. You are the only person I know that can get more out of chicken than my grand mother. Especially like the white chicken chili. Elk broth! ahha! new uses! (obviously organic) from free bones also…. I canned up a couple dozen jars of elk broth this last year, and some of these recipes will work just great with it! And they will work with my canned turkey broth also! Will keep these in mind – just for the versatility! I rarely buy chicken just because I get so much free geese, elk bones, and deer bones, and fish scraps given to me… but these recipes you have are very versatile! Wow, this is one of the most in depth and helpful articles I’ve stumbled upon in a long while. And your pictures are making me so hungry! 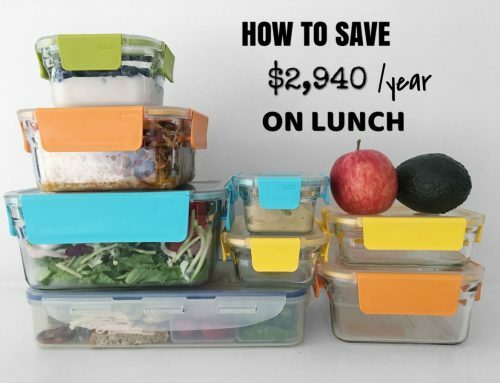 This has to be one of the most useful and reasonable frugal food posts I’ve ever read. I’m definitely going to try something similar. Thanks! A girl after my own heart! Being British and having grown up in England after the war, there was not a lot of choice. Still eat many of those same things, beans on toast, sardines, herring,etc. Love your web site! Keep it up. Brilliant. I made a 7lb chicken and after we enjoyed the delicious first meal, I got 2 litres of stock out of the carcass, and an additional *7* cups of cooked chicken. You’re right – there’s a TON of meat on there! Today I’m making chicken pot pie and will still have a litre of stock and 3 cups of chicken left over. Thanks for the inspiration! What a great post- I am totally with you on the crockpot, as a working woman it is so great to come home to hot meal, and a house full of those tantalizing smells. I have never bought an organic chicken because of the expense, but your post makes me rethink this! This was an awesome post! Truely Awesome. 1. crock pot, 2. cooked chicken recipes, 3. no dairy present, 4. 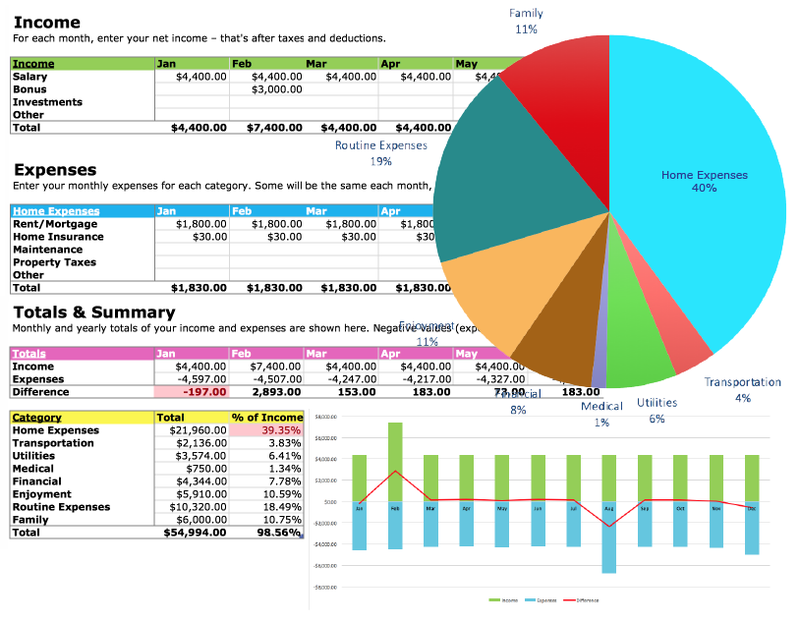 THE PIE CHART! Do you have these articles in printable friendly pages with out the pictures. I would like to print all of them and put them in a binder to use in the kitchen. Thank you for the great article. Chickens in the grocery stores are so small and useless that I do not buy them whole. When I lived in Halifax I would go to the farmers market and buy large(6-9 lbs) birds and cook like you are doing, using every part of the chicken, feeding a family of five. This was impressive. I never would have thought so many meals from one chicken was possible! You missed one… sort of. I study and teach historic cooking methods, especially recipes and menus from the Renaissance. One of the standard tricks to “stretch” a raw chicken was to skin it (cutting it open from the back, which would be face-down on the platter) and remove all of the inside except the wing tips. This works especially well if your family likes giblet gravy, since you can mince the simmered giblets almost to paste – or just use a blender/food processor – and add them to the stuffing without any complaints about excess chewiness. Also, since I am casein intolerant as well as gluten intolerant, I _always_ cook the chicken fat down with onion for home-made schmaltz. Just a dab makes many things normally cooked with butter taste as good as, or better than, the forbidden original version. Honour – well that is one that I have never heard of – but I like it! And I think it would work just as well for geese or ducks – thanks! 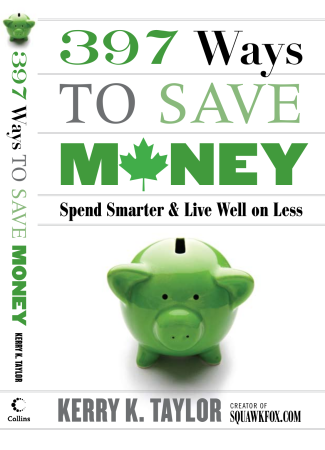 I write a column for our local paper with tips for frugal living. A few months ago my column was “Four Meals out of One Chicken.” Although with your counting, it would have been 24 as we have six people at home. We had stir fry, chicken gravy w/ mashed potatoes, chicken/broccoli casserole (healthy, non-creamed soup variety), and chicken noodle soup. I’m wondering, though, you didn’t mention using the giblets and/or neck meat in any of your dishes. I hope they were included. 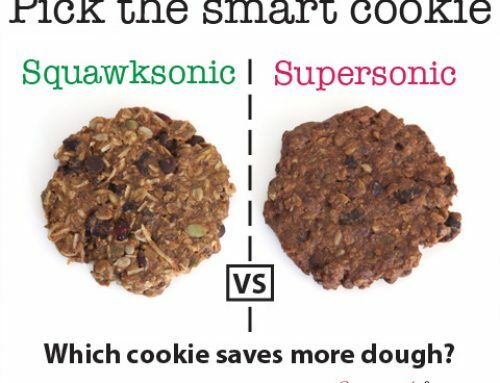 I love the push for the smart use of food in this article. 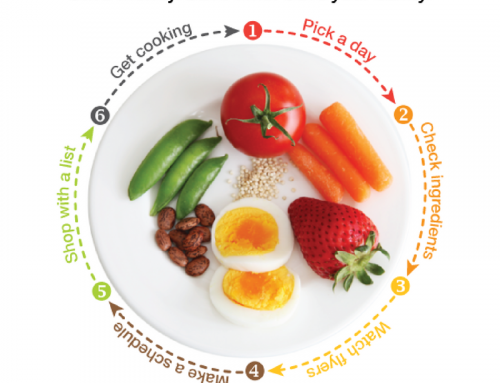 Reducing waste and cost, and controlling portion size…great things that do not get enough attention. Well done! I can hardly wait to try this, although I think I’ll sub the white chili for the lentil soup, based on my family’s preferences. Thanks so much! This is the first time I’ve seen your blog and I plan on being a regular reader. Love this! I am including it in my Personal Finance Roundup this week. I am completely impressed. Feeding a family of 5 I don’t usually get as many meals as you do out of a chicken. But you do have the frugal me convinced of trying an organic roasting chicken. After seeing how much meat you got out of the organic chicken I am willing to give it a try at least once. I love the idea. but can someone explain it to me that how the 22 meals adds up? I counted 16. I just don’t get it. Chicken stock is cheap to make if you ask the butcher for chicken racks (left from all the boneless meat they sell). My butcher sell them for about 25c/lb. 4 or 5 pounds and a big stock pot. Here’s a tip if you’re trying this. Remember to turn on the slow cooker before you leave the house in the morning! Will be returning home at lunch. Roasted chicked was yummy last night and my broth smelled yummy. Really looking forward to this week’s dinners. My husband and I usually buy one of those excellent rotisserie chickens at Costco, and make it last half the week. Second day: slice off some more chicken bits and mix them into alfredo sauce with more veggies, serve with pasta. Third day: put the remains of the bird in the crock pot with water and italian seasoning blend before leaving for work. Come home to strain out the bones and add any meat left on them back into the pot with some pre-cooked rice and veggies. We usually save this for when we have company over, since it makes a lot and we’re not really fans of leftovers. End up with basically 4 meals for our family of 3 for 10-15 dollars total. Wouldn’t want to do this every week, but it’s nice to get so much food out of a $5 bird. @Carol J Alexander – Would LOVE to see the recipe for “chicken/broccoli casserole (healthy, non-creamed soup variety”! Please! Your article is interesting. Where do I buy an organic weighing 6.28 for under $22. I enjoyed this post orginally & am glad to see it made the Top Squawks list! I have always been thrifty but the past few years have been a bigger challange due to the economy etc. My husband works in construction and has not worked more than 12 weeks straight since 12/07. I have been roasting a turkey every couple of months for the past 3 years. Like you Kerry, we are a 2 person household plus I work full time. I buy the turkey when it’s on sale as a loss leader or marked down after holidays. After we have a couple of good roast turkey meals I do the same thing you did as far as processing & then I freeze various meals. I also freeze some of the meat in meal sized portions (great if you are pressed for time). That way I can throw something in the crock potfor dinner or take a ready made meal out of the freezer. 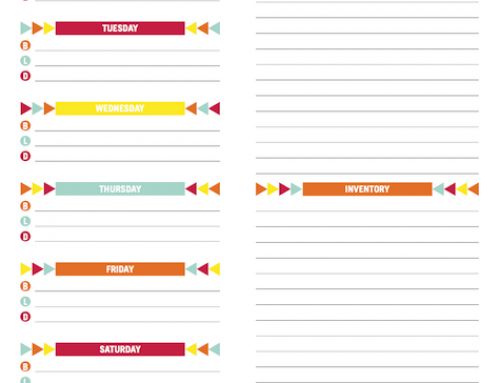 This has been a HUGE time and money saver! You did an awesome job with all the calculations. That’s always the most time comsuming part. Thanks for all the great information and photos. Pivo is the BEST model!! After baking your chicken, pour all the juices into a glass jar. Cool. The fat will rise and harden. Remove. What is left is chicken stock “jello”. Add this to your water and rice and cook as normal. YUM! Love your blog and especially this post. Another suggestion for non-soup use is to remove the cooked meat from the bones, shred, mix with onion, garlic, cumin, and canned tomatoes. Cook all together then freeze for quick chicken tortillas. Also great for turkey leftovers. Well , I didn’t follow all your rules, but I applied stretching the chiken concept to indian cuisine ( i m an immigrant from india) and I got full flavoured 14 desi meals. I used 1.5 chiken breast to make 4 servings of chicken-biryani. 2 chicken thighs and drumsticks to make fried chicken that we had with rice and lentil-curry (2 servings). 1/2 chicken breast with sautéed veggies to make 2 roti-wraps (Indian version of burrito). Chicken wings and other leftover meat was made into a chicken “rogan-josh” curry with cauliflower and chickpeas and rogan-josh curry paste available in the supermarket(4 servings) with a side of rotis. I used 1/2 of the chicken stock to make rasam- curry to have with rice and veggies and 1/ 2 of it to flavour a veggie soup. I am glad i stumbled upon this post and took it on as a project. Thanks. I want some of those recipes, Mjoe. Sounds delicious. How much quinoa would you put in the chicken noodle soup to replace all the pasta? 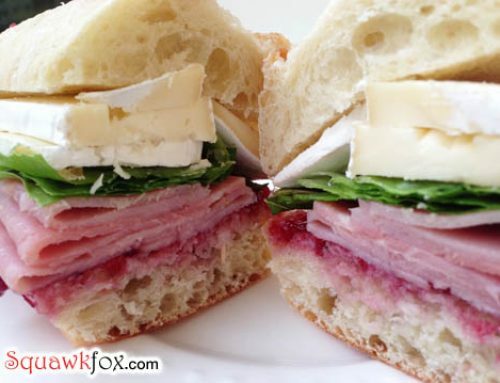 I started following squawkfox since I saw it advertised on OWN. I love it!!! I set out to take pictures of the meals that I made with the 1 chicken. Added some lemon zest and rosemary and garlic to the outside of the chicken before baking and before I knew it, bits of the chicken were gone before I could get my camera! I call this the “chicken regimen” and I do the entire rotation of meals whenever I need to save for something major (vacation, purchase, etc.) thanks! It looks like you made 5 meals for 2, or ten meals. You can’t count each side dish as a meal. One meal is one main course plus whatever side dishes you have. Am I wrong about this? I raise laying hens and look forward to stew hens every few years for this very reason-so many meals from one bird! Thanks for encouraging people to make the most out of an often over looked (and delicious)form of animal protein! PS Ask your local egg purveyor at the farmer’s market if they ever have stew hens available- often more affordable than younger birds like broilers and fryers and SO MUCH more Flavor!! wow, i don’t feel like such a skinflint after reading this! i’ve been doing a lot of this for years; in fact, when i cut up a fresh onion or carrot, i save the ends in the freezer to use when i make the broth! i also dehydrate my own celery to use for seasoning, since around the holidays i can usually get it for under 50 cents a bunch. i like the soup ideas, but i also use a fair bit of the chicken for my chicken/cheese quesadillas and enchiladas, or chicken salad, or chicken pot pie, or….the possibilities for leftover chicken are almost endless! I am so inspired. 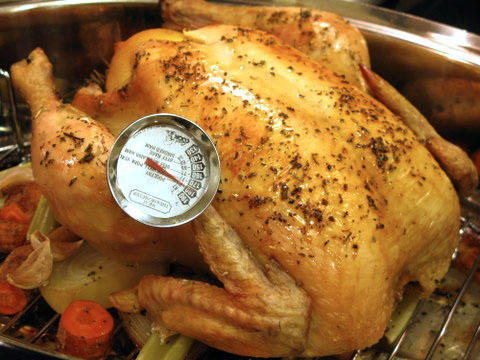 I do whole chicken similarly, except use a pressure cooker. Cooks in about 30 mins., let rest/cool, remove skins, icky stuff (goes to dogs in small portions); shred most delicious moist chicken. All I throw away is bones. I typically use for huge pile of shredded chicken for chicken encilladas. (my guests rave about my chicken enchillads–secret is pressure cooked chicken and green enchillda sauce). Broth is reserved for other cooking. But now, today, I am going to pressure cook a chicken for a weeks worth of meals; and chili, soup, ? ?, will be born. Thanks for the inspiration, meal ideas! I make stock from the holiday turkey every year. I strip as much meat as I can from the bird’s remains and toss into a bowl. The bird goes into one of DH’s stockpots he bought for beer making. Add lots of water, a couple of onions, quartered, 3-4 celery stalks, and a bunch of peppercorns. Then I boil it for 7-8 hours, adding water as needed to keep the level up. While that’s boiling I bag up the meat for the freezer.A couple of handfuls to a bag. After the turkey has cooked all day I strain it into a corning ware pot, which goes into the fridge for the night. Next morning I skim off the fat and package up the stock… it will look like brown jello, into plastic containers and freeze. When we want some turkey soup I pull out some stock and a bag of meat, toss into a large pot to thaw and heat up, add what ever left over veggies are around and some left over rice or pasta or noodles… what ever is there. I add a bit of dry sage and call it supper. My boys love it!! !It cleans up left overs a couple of times over. There are endless casseroles using up left over rice, pasta, couscous, polenta, cheese, ham, veggies. I give it a made-up name like Tango Tonight and it’s fun to eat. Chowders, deep dish pies, wrapped in biscuit dough or wonton wrapper, dumplings and an endless variety of salads, soups & stews. With summer fruit plentiful try sauces like orange, apricot, peach, pineapple, cherry to perk up boring chicken. Where did the other 3 cups of chicken come from?!! I counted 2 half breasts, two wings, two legs, two thighs, 1 reg breast, and then you wrote “1 cup chicken” and “2 cups chicken” for the last two recipes!! Where is that meat comming from?! Even with the gibblets and the back meat I can’t just randomly “find” 3 cups of chicken. Am I crazy?! What kind of “wraps” do you buy, Kerry? We eat gluten-free as well and haven’t come across any yet. Well . . . you are cooking for two. I am cooking for 6, three of them BIG men. That chicken would have been pretty much decimated at the first meal, with a little meat and a carcass left over (from which I would make stock for a future recipe). That was one BIG chicken, though – over 6 pounds – quite impressive! Most regular chickens are in the 3-1/2 pound range, so in that regard I think you got a screaming deal! It sounds to me like you and your hubby got five days worth of dinner, with leftovers that may have been frozen for another time. I’d say you got your money’s worth! Good job! Here that $49 shopping list would cost me $100 for sure. Loved the recipes though! !